Brrr... rushing indoors for the start of the 2019 track and field season was a welcomed reprise from one of the harshest stretch of winter in recent years. The Chicagoland area was hit by a "Polar Vortex" that saw temperatures plunged to -21 (-50 wind chill)- virtually paralyzing civilization. Schools were canceled for much of the week, but fortunately meets from around the area were allowed to commence. 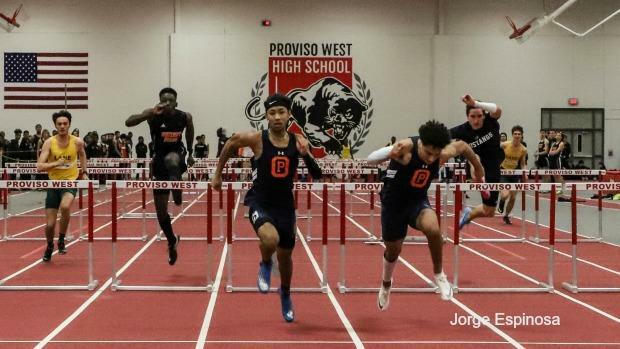 A complete remake of the Proviso West High School was met with high-grade remarks from fans, athletes, and coaches. It didn't take long before the athletes christened the track and field facility. Kyshun Robinson (Jr., Hillside Proviso West) wins the long jump in a personal best 21'3.5"